The best product requires the best plastic injection molding equipment. We’ve spent years learning what works and what doesn’t. We’ve developed a breadth of knowledge that allows us to find the most dependable machines for the job. Our machines can handle any situation from material drying, to cavity pressures and cavity temperatures. Plastic molds have to be exact. The products that are run through them have specific requirements that must be met. 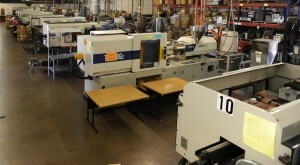 We have 16 different machines prepared to meet your needs.